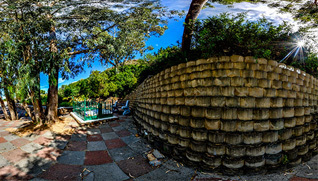 The Shrine is situated some distance from the road on "Islam Hill" in Groot Constantia and has a beauty all of its own. The need to walk up the hill fills you with a desire to pay your respects to this noble saint is his majestic court. At the end of the 19th century there was a great influx of Muslims traders from India who followed the Indians brought to this country to work on the sugar plantations in Natal. 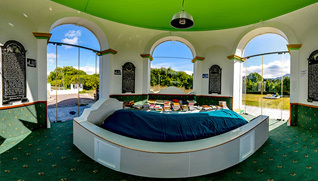 The Cape Mazaar Society was formed in January 1982 initially for the upgrade and maintenance of the Shrine of Sheikh Abdurahman Matura (R.A.) on Robben Island. However the name chosen "The Robben Island Mazaar (Kramat) Society" was rejected by the old Prison Authorities. 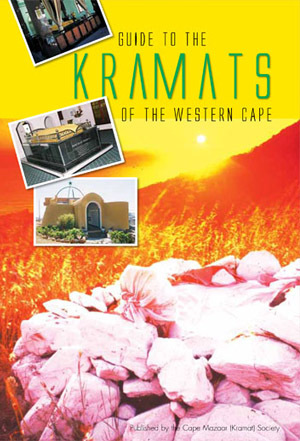 Changing the name to "The Cape Mazaar Society" meant that we now had to look at all the Kramats in the Western Cape as custodians. 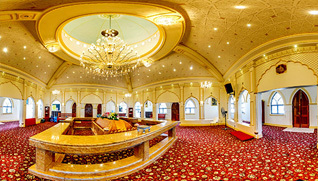 The Cape Mazaar (Kramat) Society is a constituted body and is recognised by the Muslim Judicial Council, the South African National Monuments Council, the Cape Regional Services Council, the Cape Town City Council and the Correctional Services Department amongst others. Their proven track record has put them on a firm standing with the aforementioned organisations. The Society's accounts are audited annually by an independent auditor.